It’s always going to be hard to get excited for the start of the season while everything off the field has been going on. Strangely the building of the squad has gone well, not huge signings but for once bodies seemed to be made in a timely manner. But then it all found down with Brad Potts leaving for Barnsley, Potts could be a great player but was so inconstant for us and when watching live he so often just went missing in games. However last season he did get 10 goals from midfield which will be a miss with no like for like replacement coming in. If you’re looking to bet on the League One this season then a great site to think about checking out is Footy Accumulators as they offer football accumulator tips for all the games throughout the season. On the pitch two 2-1 defeats so far – but against Bradford and Wigan who both should do well this season. Next up is MK Dons who also lost to Wigan, 1-0 on the first day of the season. MK finished mid-table last season bank in the middle after being relegated from the Championship. Last season was a bitter-sweet for Blackpool. On the one hand, they won their first promotion since that glorious Wembley victory over Cardiff in 2010. On the other, there were around 35k fewer fans in London to see it. Many boycotted the best moment of the season in order to protest, understandably, against the Oyston regime. The spirit and camaraderie within the dressing room remained strong however – and these are six players who could improve the Seasiders’ squad ahead of the 17/18 League One campaign. Gary Bowyer has spent 11 years of his career at Blackburn and would be foolish not to utilize his contacts at Ewood Park. If Charlie Mulgrew and Darragh Lenihan stay with Rovers, or if another defender joins, they may be open to loaning out the 19-year-old, who recently impressed at Cambridge. Wharton may be deemed to be too young by Tony Mowbray but at Blackpool – who are 6/4 for relegation with Bet Ways as of the 11th July – more grounded expectations present a little more room for error. Tom Aldred’s move to Bury means Pool may require a centre-back, especially if Bowyer plans to use three at the back. The wing-back system gives Kelvin Mellor and Andy Taylor the freedom to focus more on the attacking side of their game, the duo providing use width last term. Taylor though is 31 and there may be scope for Pool to upgrade on Colin Daniel as competition in this area. Mitchell has progressed steadily through the ranks at Manchester United in more than one position, having an impressive debut at left-back against Crystal Palace. The Red Devils may at a push be willing to let him go out on loan to a nearby League One club, although if they expected the 20-year-old to start every week, that would complicate matters with Taylor named captain. Aldred started as captain in the play-off final, but when he went off injured, Neil Danns took on the baton with some aplomb. The Bury loanee battled superbly in the second half, imposing his physicality to ensure Exeter passed sideways and never broke into the final third. The Seasiders will have similar tactical ambitions in a lot of their games this season, particularly away from home and a return for the experienced Danns – who has often played at Championship level – would help their cause. If a deal for Danns cannot be reached, then perhaps John Welsh would be a good contingency option. His defensive discipline was key to Preston North End’s promotion in 2015, particularly in the crucial play-off games. Blackpool need a holding midfielder with Jim McAlister their only option at present. While signing a player from the Lilywhites may not seem attractive, it’s worth pointing out that the likes of Tony Ellis and Brett Omerod made themselves cult heroes at Bloomfield Road. Barnsley are reportedly interested in Brad Potts, who combined well with Mark Cullen for numerous goals in the play-offs according to Soccer Base. Should the Tykes show desperation to sign the 23-year-old, Bowyer may sense an opportunity. He could demand a player plus cash deal involving George Moncur, who is the same age and does a similar job to Potts but has arguably done it at a higher level, with a better goalscoring record to boot. The signings of McGeehan and courting of Potts may make Moncur feel uneasy about his position at Oakwell and Blackpool could take advantage. Reports suggest Aston Villa had shown interest in Bright Osayi-Samuel, who caught the eye with his impressive solo goal at Newport. While the inside forward did well last season, he only started 13 times and may not fit smoothly into a first eleven which will include two out-and-out strikers and an attack-minded midfielder. Pool could use the youngster as a bargaining tool for getting Mark Bunn. The goalkeeper has only started 15 league games out of a possible 84 at Villa and having possibly met Bowyer in his time at Blackpool, he may be willing to drop down a league to get regular games. This may be harsh on summer signing Ben Williams, but Myles Boney needs to prove himself lower down the pyramid before becoming second choice at this level. The aforementioned sextet may be slightly ambitious, but Blackpool already have 28 senior professionals on their books, so any new signings must improve the quality of their first eleven. It has been a sorry tale for Blackpool since the heady days of the Premier League, with multiple relegations seeing the club languishing in League Two. Managers have come and gone, with current incumbent Gary Bowyer the Seasiders’ eighth boss in three-and-a-half years when he took the reins in 2016. Currently one place outside the League Two play-off zone, it remains to be seen if they can make the post-season, there are of decent odds available from online bookmakers if you want to place money on their chances if you fancy their chances of making the playoff games. There have been the odd bright spots to dwell on, with a few players who have given the fans cause for hope during what has been a dreadful spell for the Lancashire outfit. Brett Ormerod may have done his best work in a tangerine shirt during his first spell at the club between 1997 and 2001, but his return following relegation from the top flight was a boost. Never giving of less than 100 per cent, the forward bagged 15 goals during his second stint and became the first man to have played for the club in all four divisions. Having scored the winning goal in the 2010 Championship play-off final to send Blackpool into the Premier League, the 40-year-old will always be part of the club’s history. Tom Ince enjoyed a couple of solid seasons at Bloomfield Road and was rewarded with a call-up to the England Under-21 side. A return of 31 league goals from 100 outings is commendable for a midfielder and, such was his prowess at the time, several top clubs, including Inter Milan, were keen. His father’s exit as manager meant the writing was on the wall for Ince and, following a spell on loan at Crystal Place, he left for Hull City in the summer of 2014. The Stockport-born schemer was real a talent and one that Blackpool could have built their midfield around had they remained in the Championship or above. Striker Kevin Phillips might have spent the majority of his playing career in the Premier League but he enjoyed a couple of years with the Tangerines and scored 16 goals from 38 appearances during the 2011-12 march to the Championship play-offs. Blackpool’s bid for an immediate return to the promised land was ultimately unsuccessful but the former Sunderland hit-man was still a class apart despite being in the latter stage of his career. Had he been able to guide the club back to the top flight, things might not have taken a turn for the worse over the past five years. Charlie Adam was part of the side that went down from the Premier League in 2011 but he was not the reason as the Scot was arguably Blackpool’s best player during that campaign. The 31-year-old has since gone on to play for Liverpool and Stoke City but his return of 28 league goals from 78 appearances while at Blackpool proved how vital he was to the cause. The Dundee-born midfield has not been part of the demise over the past few years and, had he stayed, he may have been the glue to hold things together. Finally goalkeeper Matt Gilks was given the thankless task of trying to prevent an avalanche of goals and his displays between the Blackpool posts earned him three Scotland caps. The 34-year-old left in 2014 but was virtually ever-present between 2011 and 2014 and, with the side on the wane during those years, it will not have been easy. But he performed admirably and his saves kept Blackpool in many games they might have lost during his three seasons. Where there is a long-running dispute between a club’s ownership and its fans on-field, success is normally hard to come by. As with any organisation, sporting or otherwise, a breakdown in this relationship (for companies swap fans for shareholders) makes for a messy situation, not the bedrock for a rosy future. Unfortunately, there are many examples of this in football right now as Hull City know only too well. Their team are stuck at the wrong end of the Premier League table and have recently dispensed with the services of a good football man in Mike Phelan. 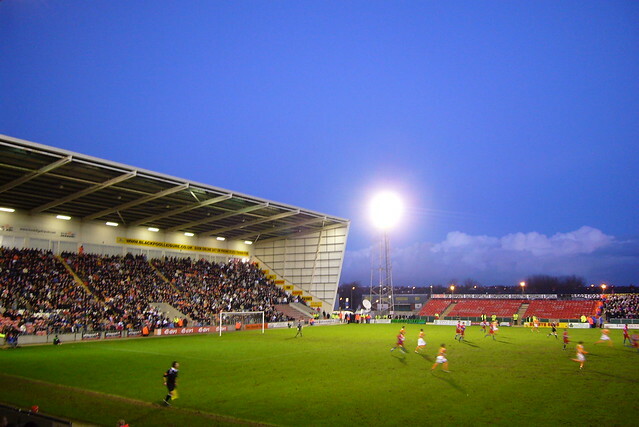 In the Championship, unrest between the board and the fans has been rumbling for years at clubs such as Coventry City and Nottingham Forest, while in League Two the Tangerine Dream has turned into a nightmare for Blackpool F.C. While Hull City fans won’t rest until they get shot of Assem Allam, Blackpool chairman, Karl Oyston, has been the target of abuse following the club’s fall from grace after demotion from the Premier League a few short years ago. The supporters have stayed away in droves – a club record lowest-ever attendance of just 766 fans turned up to see their side bow out of the Checkatrade Trophy against Wycombe the other night – and playing at home has become a handicap not a help. A run of three home games in the space of just eight days clearly places pressure on the purse strings of fans; however, the mistrust and antipathy towards Oyston and his cohorts is the biggest factor behind so many stayaways. Stuck in mid-table and without a win since they beat Hartlepool, a run stretching to five matches, Blackpool need all the encouragement they can get if they are to somehow turn the situation around and make a late push for the play-offs. That said, Gary Bowyer’s side are only five points off the play-off zone in League Two and have a game in hand on seventh-placed Colchester. Also, their goal difference of +11 is better than those teams immediately above them. After Tuesday’s F.A. Cup 3rd round replay, Blackpool take on Yeovil at home and then follow in the footsteps of Liverpool and make the long trek down to Plymouth, a game likely to be hotly contested by tipsters such as SBAT. Argyle sit second in the league and have their tails up after holding Liverpool to a 0-0 draw at Anfield in the cup, so getting anything there might be a tough ask, which makes bagging all three points against Yeovil, who are four places and four points below them in the table, all the more vital. Win that game and the next two at home, against Colchester and Crawley, and Blackpool fans might start believing that bad things can sometimes turn to good. First, they’ll have to mend their goal-shy ways, a problem that has bedevilled quite a few managers who’ve passed through the Bloomfield Road revolving door in recent years. Only once have Blackpool scored more than one goal in a game (2-0 away to Luton) in the last 10 games, in league and cup, producing a paltry return of six goals. With that sort of fare on offer, no wonder the fans are reluctant to turn up. After all, there is plenty more excitement to be had elsewhere in Blackpool, where the phrase ‘being taken for a ride’ has a much more positive connotation. Can Bowyer Lead Blackpool Back to League One? Blackpool are on the right course to regain their place back in the third tier of English football, despite their off-the-field problems. 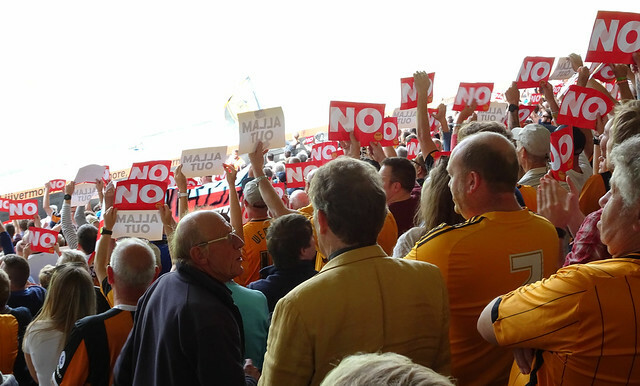 Supporters are still demanding the removal of chairman Karl Oyston due to his perceived mismanagement of the club following their fall from grace over the past five years, including back-to-back relegations into League Two. Player sales and poor managerial appointments started the slide, but the club appear to at least be on their way to solving their problems under the tenure of Gary Bowyer, who has begun to steady the ship. The Tangerines have been solid in their campaign thus far, but a strong run in the second half of the season could see them challenge for a place in the playoffs. Bowyer’s men are currently five points off the pace of seventh-place Barnet, although they do have a game in hand on some of their rivals battling for the four spots. As a result, Blackpool are backed in the latest football betting odds at 9/2 to earn promotion back to League One. The Tangerines have been one of the most inconsistent sides in the division this term, although they have managed to stave off poor runs of form that can often run sides down the table – as fans are well aware of given their struggles in recent seasons. Bowyer has managed to establish some semblance of a solid outfit and since the beginning of November, the club have enjoyed more wins than losses or draws, suggesting that the manager might well have cracked on to a successful formula. Defensively Blackpool have been strong at the back throughout the campaign, conceding just 25 goals in their 24 matches. Clark Robertson, Kelvin Mellor, Tom Aldred and Andy Taylor have formed a resilient unit, which has kept seven clean sheets in League Two and notched another in an impressive display in their FA Cup tie against Championship outfit Barnsley. Should they raise the level of their performance towards the end of the season they can be the foundation on which the Tangerines can launch a push for the playoffs. At the other end of the pitch, Bowyer’s side are in the middle of the pack with 36 strikes to their name this term. Kyle Vassell has led the way with nine strikes, but the club must find a way to alleviate the pressure on him. The 23-year-old has failed to find the net in his last six contests, including the Tangerines’ 1-0 defeat at the hands of Mansfield at Bloomfield Road. Jamille Matt and Armand Gnanduillet will need to rise to the occasion as they have scored just five goals between them, although Brad Potts has displayed a propensity to push forward from midfield to chip in with six strikes. Blackpool will need a surge of goals in the second half of the season and Bowyer will have to ensure that the burden does not all fall on Vassell. After years of disappointment, the shoots of recovery might now be in progress on the pitch at least. However, Bowyer and his men must maintain the standards they’ve set in the first half of the season and improve in all areas to drive back into the third tier.